This practical manual explains the difficult concepts involved with fluid therapy in an easy-to-understand exploration of the subject, written at an appropriate level for nurses and technicians. Coverage includes different types of fluid therapy equipment, assessment of fluid balance, and administration of fluid therapy. Practical tips offer valuable advice throughout the book, and flowcharts and boxed key points clarify important information. Covers everything the veterinary nurse or technician needs to know about fluid therapy and how to apply theory to practice. Serves as a practical manual that explains this difficult subject in an accessible and easy-to-understand approach at an appropriate level. Improves the reader's skills with "In Practice" tips for effective fluid administration. 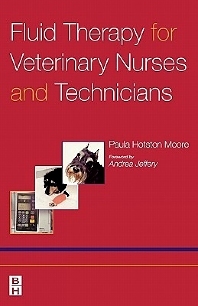 Covers the NVQ Level III Part 2 syllabus, making it an essential purchase for second year veterinary nursing students as well as veterinary nurses in practice.